Our Zona Rosa location is at 6110 NW Barry Road, Kansas City, MO 64154. This location is 2 blocks east of 1-29 and Barry Road next to Hobby Lobby in The Boardwalk Center. We are located near the Zona Rosa shopping area that has over 86 stores and restaurants that service the Platte County area. The manager at our Zona Rosa location has over 18 years of experience at Slim4Life. 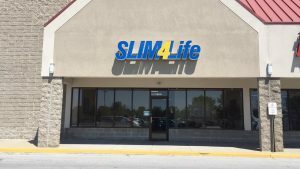 She was one of the very first Slim4Life employees in the Kansas City market. She has helped countless clients reach their weight loss goal and improve their health. She works hand in hand with her staff to share her knowledge and make sure that the clients have accelerated weight loss and have long term results. This team is committed to helping others improve their lifestyle and overall health . Call Zona Rosa for your free consultation to get started today. Make an appointment at our Zona Rosa weight loss center today!